What should I check before going live on Android? Follow this guide to make sure Batch's SDK is integrated correctly before going live on the PlayStore. 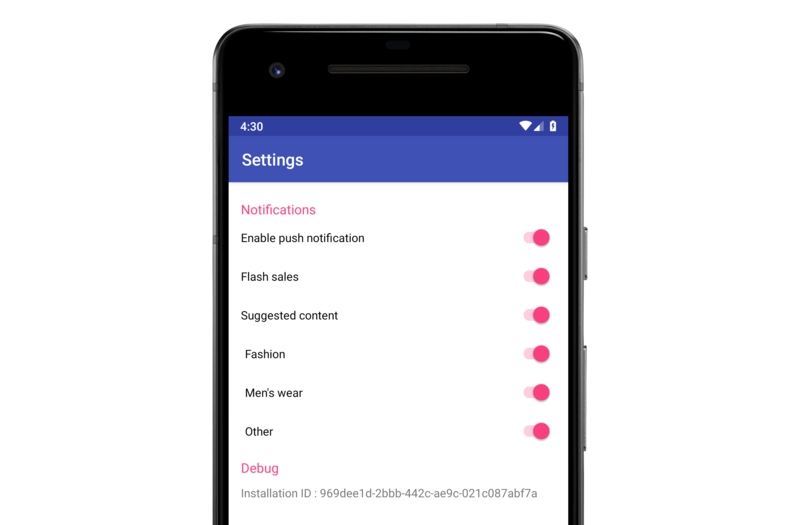 First and foremost, make sure you are using the latest version of Batch SDK by checking our Android changelog. You should only use the Dev API key for development purposes. Make sure you switch to the Live API key before releasing a new version of your app to the store. 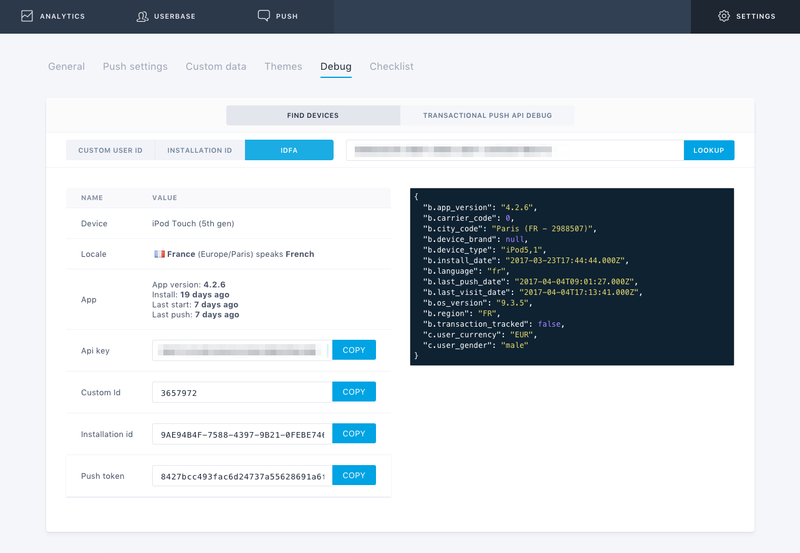 Find the right API key from Batch's dashboard > Settings > General and change it in your code (more information here). What is the small icon? The small icon is the icon Android displays in your notification. How to test the integration? 🚧 Don't know how to send a test notification to your device? Follow the steps described in our guide: how to send a test push to my device? You will need to set a valid small icon. It should be opaque white, using only the alpha channel and 24x24dp (more information here). You can also set an accent color for your small icon (more information here). In-App messages are messages displayed inside your app. You can trigger an In-App message when users open your app, perform a specific action or as landing pages after opening a push notification. Go to Settings > Themes. Pick a theme or create a new one (more information here). Select your device token, then click the "Preview" button. The In-App message should be displayed correctly, ideally after your splash screen. Batch's SDK tries to display the In-App message as soon as possible. This can cause display issues as other elements of the app (e.g. ad, loader, splash screen, etc) may close the In-App message or prevent Batch's SDK from displaying it. You can avoid these issues by using the "Do Not Disturb" (DnD) mode. It allows you to tell Batch to hold on a mobile landing for you and resume the In-App display once the app is fully loaded. You will find more information here: DnD mode. What kind of custom data can I collect from the SDK? Send a unique user ID (more information here). Collect user data (e.g. attributes or tags) and track user actions (e.g. events). Send a recent user location, if geolocation permission is already granted (more information here). Track transactions, in case users can purchase content in the app (more information here). A GAID, in case the app shares it with Batch's SDK. An Installation ID, which is an anonymous ID generated by Batch. A custom user ID, that should be the unique user ID you are sending to Batch from the SDK. Custom ID: This field shouldn't be empty if you are sending it to Batch and are logged into the app. Make sure that ID disappears after your log out. Push token: This field should not be empty on Android. Double check your logs to see if the SDK gives you more information on the issue. Attributes / events: Your attributes and events will appear in the right panel of the debug tool. Make sure important attributes are sent to Batch in the right format (e.g. date, string, boolean, etc) and at the right moment (e.g. on the first start of the app and/or when a value changes etc). Events will appear as soon as you perform the tracked action in the app. Last location: In case you share with Batch the most recent location of your user, you should see a latitude/longitude in the right panel of the debug tool. To ease the debug, our clients usually display the Installation ID somewhere in their app (e.g. In a page of the app settings). That installation ID can safely be exposed to your end users, who can then give it back to you if they are experiencing push trouble with their app. If you have any question, don't hesitate to ping us at support@batch.com, or directly on the live-chat!